There were perfect starts by the Singaporean Nacra 17 team and from China's Jiahui Wu as racing got underway at ISAF Sailing World Cup Qingdao. With Asian Olympic qualification spots on the line in the Men's and Women's 470, Finn and Nacra 17, the stakes are high with sailors aiming to put down an early marker. 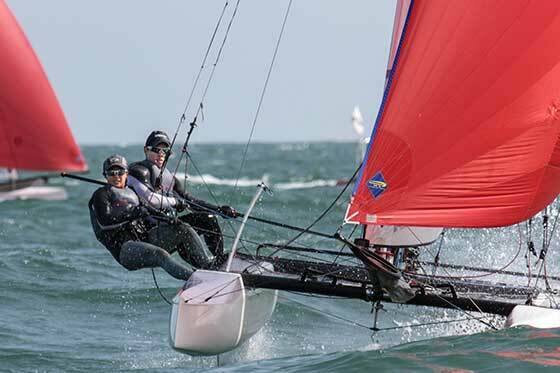 Singapore's Justin Liu and Denise Lim in the Nacra 17 and Jiahui Wu (CHN) in the Women's RS:X were models of perfection, notching up three straight wins apiece to lead their fleets. Racing was hard and tough across the nine fleets competing in Qingdao with Abu Dhabi final spots, a share of the 150,000 Euro prize fund and World Cup medals on the line. Qingdao's strong tide, which peaked at 2m/s, as well as a variable southerly breeze that ranged from 5-15 knots, put the 320 sailors from 32 nations to task with plenty of ups and downs. It was the perfect start for Singapore's Justin Liu and Denise Lim in the Nacra 17 as they won all three opening day races. As the Asian Nacra 17 qualifier for the Rio 2016 Olympic Games, the stakes could not be higher as it is the last chance teams from China, Hong Kong, Japan, Singapore and Thailand have to book an Olympic spot. On the face of it, the Singaporeans performance seems to show that they dominated but out on the race track there was minimal separation. Liu and Lim had to come from behind to take their victories and they now have a two point advantage at the early stage of the competition. With three more days of fleet racing ahead of Sunday's Medal Race there can be no time for complacency and Liu remained modest about his day's work in Qingdao, "It was only at the end of the day where we thought it had gone well," he commented. "Everyone raced us really hard today. Hong Kong, Thailand, Japanese and Chinese are all really strong and it was neck and neck at times in all three races. We're just very happy to be at the front. "Today was a really tricky day because we had all sorts of wind. We had 12-15 knots and big waves and then sometimes it was 2-5 knots. It was all over the place but we did a really good job. My crew and coach quite enjoyed the conditions but we had a really good day so we're happy. "We will take each day as it comes. One day at a time and try and do our best on each day and hopefully it will end up well for us." Hong Kong's Tat Choi Fung and Yu Ting Chan pushed the Singaporeans hard across the opening three races and are two points behind following a pair of seconds and a third, which is discarded. China's Zijin Wen and Rubei Yuan follow in third. Spain's Onan Barreiros and Juan Curbelo Cabrera started well in Qingdao to take the lead in the 26-boat fleet. The Spanish duo took the victory in Race #1 and backed it up with a fourth in the second and Curbelo Cabrera was pleased with the performance, "The start [in race one] was good, we found a good feeling with the boat. We went left on the first upwind and when we tacked we had a good shift. We were lucky because we arrived first at the first mark and we were able to just keep our distance. "We are really happy with the boat as it's not ours. We have been working hard over the last few days on the boat and now it's just like our boat," he smiled with his hand on his charter boat. Barreiros and Cabrera took bronze at the 2014 Qingdao edition and are pleased to be back at the venue for the second time with golden aims, "The culture is really different here," explained Curbelo Cabrera, "but the people are really good. We are very happy to be here because the organisation, the club, the marina and the installation are very good and we want to be here every year." 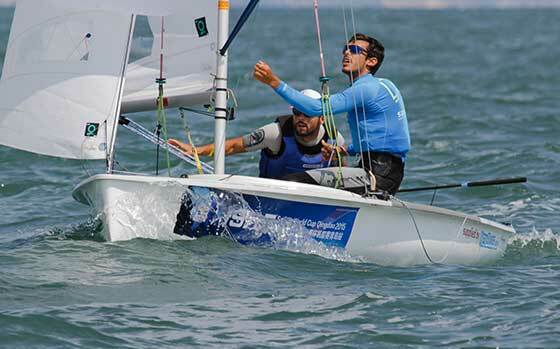 Whilst the Spaniards have their eye on winning gold, sailors from China, Hong Kong, India, Korea, Malaysia, Philippines, Singapore and Thailand are all aiming for the single Asian Men's 470 Rio 2016 spot that's up for grabs in Qingdao. After two races, it's advantage China with Xiujian Huang and Yang Weng occupying second overall on nine points. Japan's Keiju Okada and Yugo Yoshida are a point behind in third, but qualified for Rio 2016 at the ISAF Worlds. Korea's Chang Ju Kim and Ji-Hoon are fourth, three points off the Chinese. In the Women's 470, Ai Kondo Yoshida and Miho Yoshioka (JPN) grabbed top spot with a third and a second. Shasha Chen and Haiyan Gao (CHN) are second following a sixth and a bullet. China's Jiahui Wu was a cut above the rest in the 19-boat Women's RS:X fleet, winning all three races. Wu won silver at the 2013 edition of ISAF Sailing World Cup Qingdao and showed her credentials on her home waters once again by laying down an opening day marker. Peina Chen (CHN) and Manjia Zheng (CHN), in second and third respectively, were unable to match their compatriots intensity and skillset as they were left in her wake on three occasions. There were ups and downs in the Men's RS:X with no sailor taking a hold of things like Wu in the women's fleet. The prize for most consistent performer goes to Cheng Chun Leung from Hong Kong. The 2013 Qingdao bronze medallist remained in the top eight in all three races, with a bullet the stand out result from the day. He sits fifth overall and is just three points off of Chunzhuang Liu (CHN) who leads. The biggest fleets in Qingdao stirred up some mixed racing on the opening day. Two times ISAF Sailing World Cup Qingdao gold medallist Tonci Stipanovic (CRO) was flying high in the opening race as he came through to seal a race victory. However, the Croatian was unable to find that magnificent form in the second race of the day and in a packed crowd was made to settle for 27th place. After the third race the discard will come into effect and Stipanovic will be aiming for a few more results like his opener to progress up the leader board and take a third consecutive Qingdao medal. At the top of the table, U.S. Virgin Islander Cy Thompson stayed consistent and strung together two top five performances. When put into context that he's also the only one with two top ten results, Thompson's performance was one that could not be rivalled on the day and he has a five point lead over William de Smet who won the opening race. 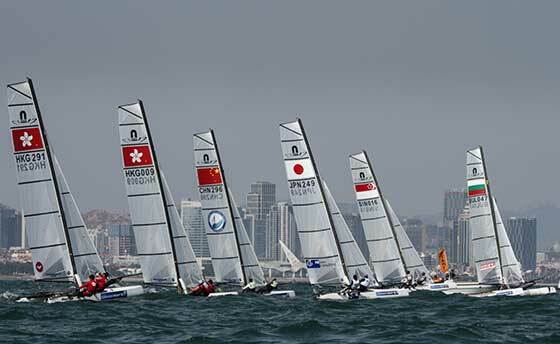 In the Laser Radial, Manami Doi (JPN) and two-time Qingdao champion Dongshuang Zhang (CHN) are tied on eight points apiece. Doi took the opening race victory and then followed it up with a seventh. For Zhang, her day featured a 5-3. Crossing the line first in the second race of the day was Great Britain's Hannah Snellgrove. The British racer posted an eighth in the opening race and as a result, sits third, a point off the leading duo. Qingdao acts as the Asian Finn qualifier for Rio 2016 with sailors from China and Iran aiming for that spot. Iran's Ahmad Ahmadi is up against it in the ten boat fleet, surrounded by nine Chinese racers. Their control of the fleet on the opening day showed as Lei Gong (CHN) took a 1-2 to lead the pack. Ahmadi posted a 7-8 and sits eighth overall. In the 49er, Bongjin Chae and Dongwook Kim (KOR) grabbed a pair of race victories from the three races to lead their compatriots Sungwok Kim and Hoyeob Yang. The second day of racing is scheduled to commence at 12:00 local time on Thursday 17 September.